Haydenville bed and breakfast travel guide for romantic, historic and adventure b&b's. 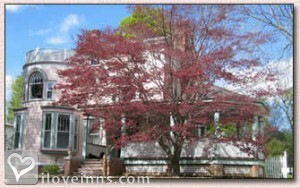 Browse through the iLoveInns.com database of Haydenville, Massachusetts bed and breakfasts and country inns to find detailed listings that include room rates, special deals and area activities. You can click on the 'check rates and availability' button to contact the innkeeper. Although it has often been described as a tiny village in Massachusetts, Haydenville is a great choice for a quiet vacation. This village possesses the typical characteristics of a New England town and offers golfing at Beaver Brook Golf Course. In summer take a refreshing dip in Musante Beach in Northampton. The natural wonders near the area include Notchview Reservation, Mt. Greylock State Reservation, Savoy Mountain State Forest, Wahconah Falls State Park, and Natural Bridge State Park. Haydenville is near famous historic sites, as well as Historic Northampton Museum, Dickinson Homestead, Bisbee Mill Museum, and Pratt Museum of Natural History. Many of these attractions are just a few minutes' drive from Haydenville bed and breakfast inns. By Penrose Victorian Inn.